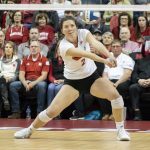 Mikaela Foecke, outside hitter for the Nebraska volleyball team, was selected as the 2018 Senior CLASS Award winner in the NCAA Division 1 women’s volleyball category. The award, which stands for “Celebrating Loyalty and Achievement for Staying in School” is handed out to the most “outstanding senior student-athlete,” according to a University of Nebraska athletic department press release. Foecke, an animal science major, is a five-time member of the Nebraska Scholar-Athlete Honor Roll. Boasting a 3.69 GPA, Foecke has twice been awarded Nebraska’s High Honors Academic Medallion. The Huskers will take on Big 10 opponent Illinois on Thursday in the NCAA Volleyball Tournament semifinal. A win would send Nebraska through to their second straight national championship match.